October 8, 2014 – Ray Bradbury died in 2012. First-Draft Me wants the next sentence to be, “And I’m slowly getting used to the fact,” but the truth is when a famous artist whom you revere dies, it’s a weird mind trip. 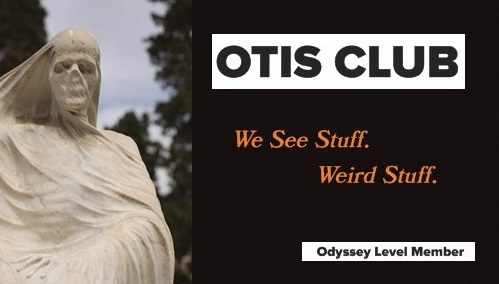 It weighs heavy on us for an extremely brief period of time, and then most of us look up and realize nothing in our lives has changed and everything you knew and loved about that person whom you’ve never met—the movies, the books, the art, the countless interviews uploaded to YouTube—didn’t go away. So Ray Bradbury died, but not the Ray Bradbury I knew. He’s still here. So I never needed closure. I just needed to see his gravestone. See, I can’t consider my experience with those who do spooky the best complete until I see their headstone…Edgar Allan Poe, H.P. Lovecraft, Bela Legosi, Rod Serling, Washington Irving. I admit, it’s a strange place to be mentally considering some of my favorite horrormeisters are still alive…and a terrible one when they get cremated and kept by family. 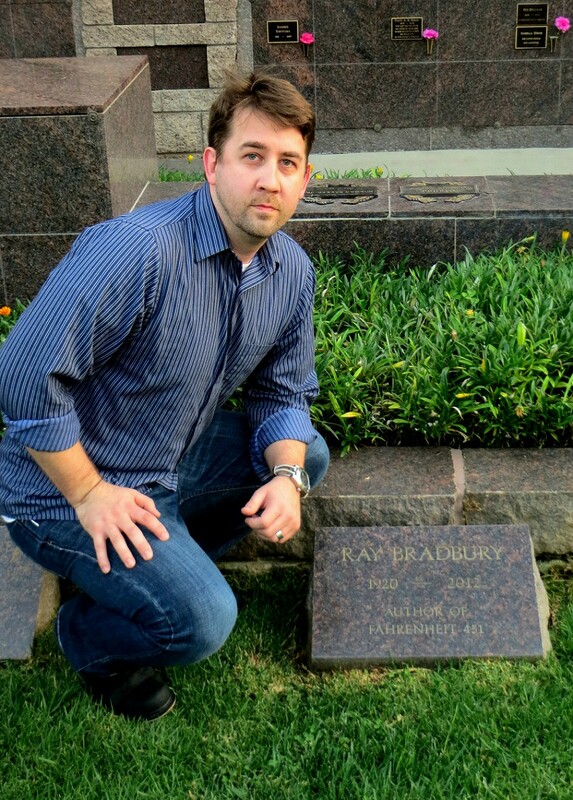 But Bradbury was interred in good old publically accessible earth, and little did I know that two months after I wrote last Halloween Season’s “The Ghost of Ray Bradbury” piece, I would find myself across the country in Los Angeles. So I sought out his grave. 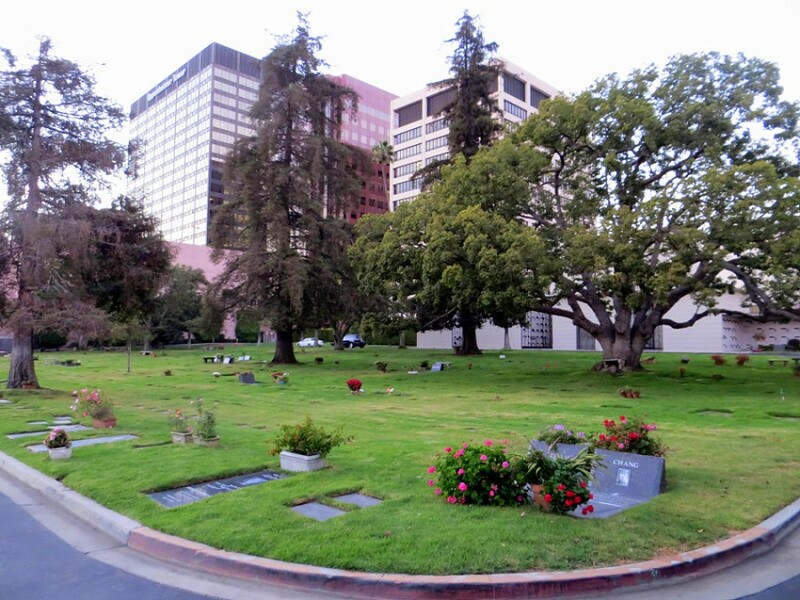 He’s buried in Westwood Village Park Cemetery, a small graveyard the size of a large back yard hidden among office buildings. It’s hardly an atmospheric cemetery. The entrance is past a parking garage on Glendon Avenue, and inside tall palm trees tower, the kinds that only look right during hurricane-force winds. Most of the grave markers are set flush to the ground and the whole area is surrounded by small, modern-looking crematoria and outdoor crypts. 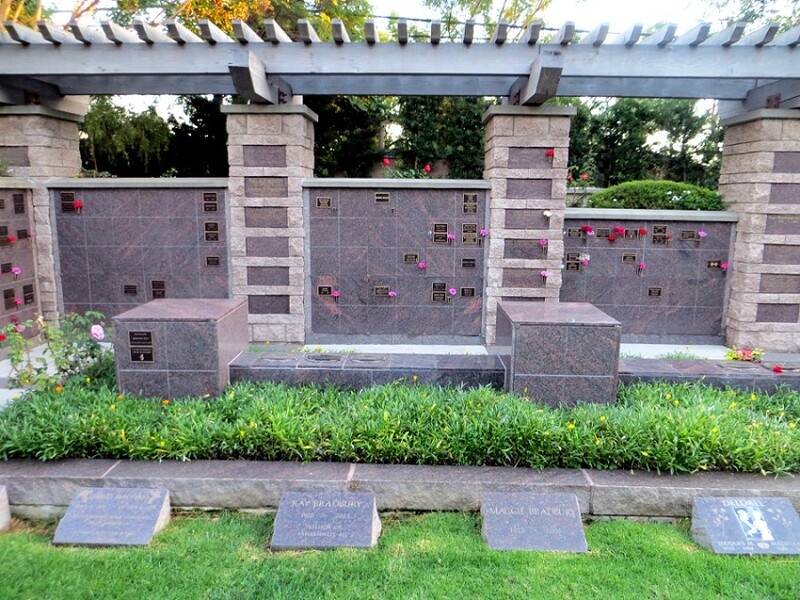 But even though the graveyard is tiny and mundanely contexted, it contains an astounding number of famous entertainers and movie and TV stars in its dirt, making it an extremely apt place for Bradbury, whose fascination with cinema and its creators fueled so much of his work. Underneath, I’m sure his bones are clacking joyously from the knowledge he's mere plots away from Eva Gabor, Marilyn Monroe, Don Knotts, Natalie Wood, Donna Reed, Billy Wilder, George C. Scott. And that’s just scratching the surface (all you’re allowed to do at a cemetery). I’m going to dedicate a second, follow-up post tomorrow to the graveyard itself. 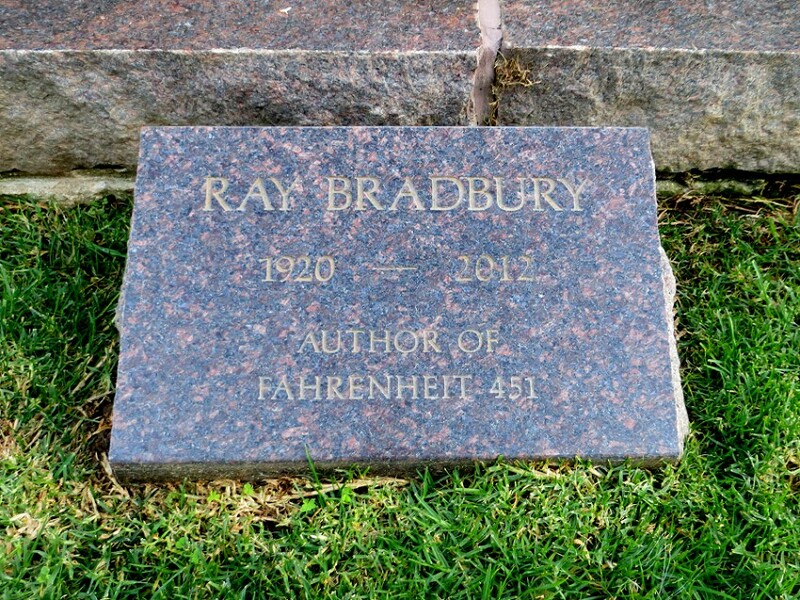 Bradbury is located near a back corner, diagonally from the entrance, in a grassy plot in front of an arbor-like crematorium. 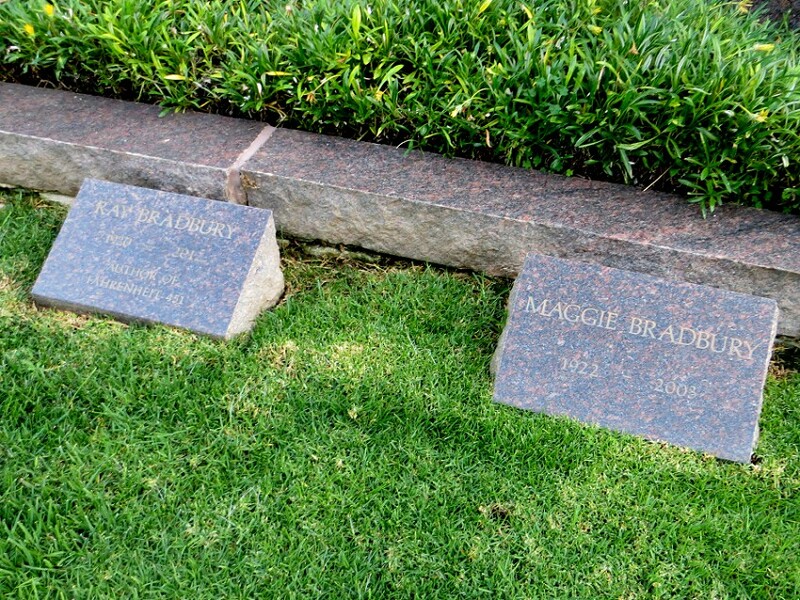 His headstone is simple, plain, small, and bears his name and death dates, as well as the title “Author of Fahrenheit 451.” He’s buried beside his wife of 56 years, Maggie, who died in 2003, about a decade before Bradbury himself. It’s not a poetic grave, nor a poetic cemetery. Although I’m sure if Bradbury had ever written about the place, he would have transformed it into something I’d want to be buried in, like the way he makes me feel about small towns in Illinois and sometimes even the gross metropolis of Los Angeles. This Halloween Season, like every Halloween Season, I’ll read one of his books. A Graveyard for Lunatics sounds like it could be particularly apt this time. I’ve never read it, as I carefully parcel out his remaining works that I haven’t gotten to yet in the hopes of never getting to the last one. Because that would be a real reason to grieve.